Okay, call me a slow learner or a good forget-ter. During the five days of caring for my granddaughter, while her parents enjoyed their baby-free honeymoon I found myself too often collapsing in a heap (usually with fussy baby in my arms –or with her just tucked into her car seat) with me gripping the steering wheel up front and reaching for my survival coffee, and later saying to whoever would listen – how did I do this back in the day? I have four adult kids. When the oldest was the mature age of five the youngest was a newborn. So yeah, I was raising a new baby, a two-year-old, a four-year-old and my right hand person back then, the girl that had my back, fetching diapers and entertaining her brothers (during all those long hours that their dad was at work) was my then five-and-a-half-year-old eldest daughter. She’s twenty-seven now – and deserved the holiday with her baby’s daddy. My honeymoon babysitting stint took place immediately following their ‘destination’ wedding on a little west coast island. After all those months of helping plan the lovely affair I was a little frazzled leaving our home to fly out for the wedding, so when I returned here with Baby the house wasn’t exactly ready for infant care. The first morning rather than packing usurped Baby into a cold car seat I was borrowing milk and Cheerio’s from the neighbours. That’s standard baby fare right? Milk and cheerio’s? I could best describe the five days as a memory shake down. Day One went swimmingly – fifteen-month-old grandbaby was just taking it all in, visiting her great-grandparents and traversing their stairs like she was a mountain guide in the Swiss Alps, and gobbling up fresh blueberries so fast I swear they thought I was starving her, then merrily spreading her funny grins around. Even bedtime wasn’t too bad even though her mom still nurses her then and all grandma was offering was an unfamiliar bottle of cow’s milk. Day Two we kept action-packed, visiting another set of great-grandparents where Baby put three little stuffed dolls under placemats and discovered them there seconds later as pleased with herself as if she were Houdini performing an escape act. 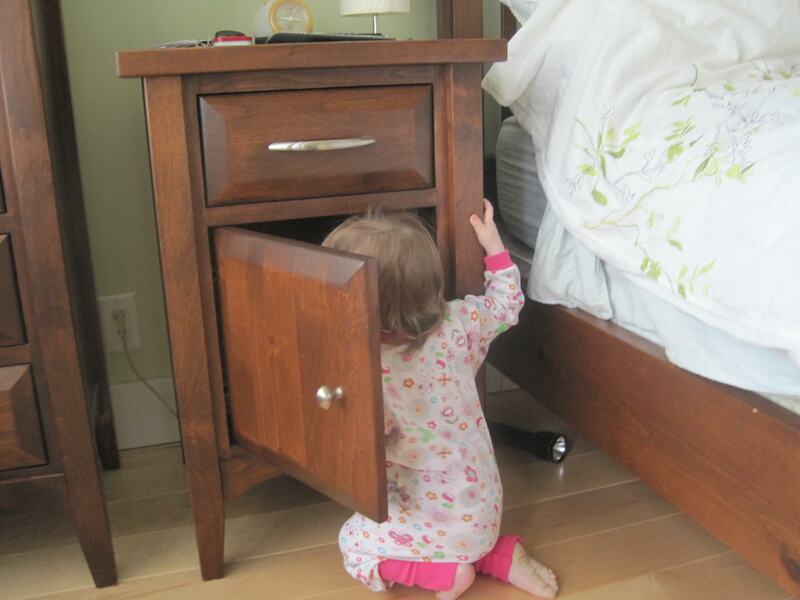 Every time she visits our place I babyproof for a different level of trickster Baby. This time I wound fat elastic bands tightly around the cupboard handles of the cupboard I most-want-her-to-stay-out-of and she most-wants-to-get-in and she expertly unwound them. I distracted her with some time in the yard. She distracted me by considering putting pebbles and twigs in her mouth. Still we were having fun, Baby and I, until bedtime. At bedtime the jig was up. 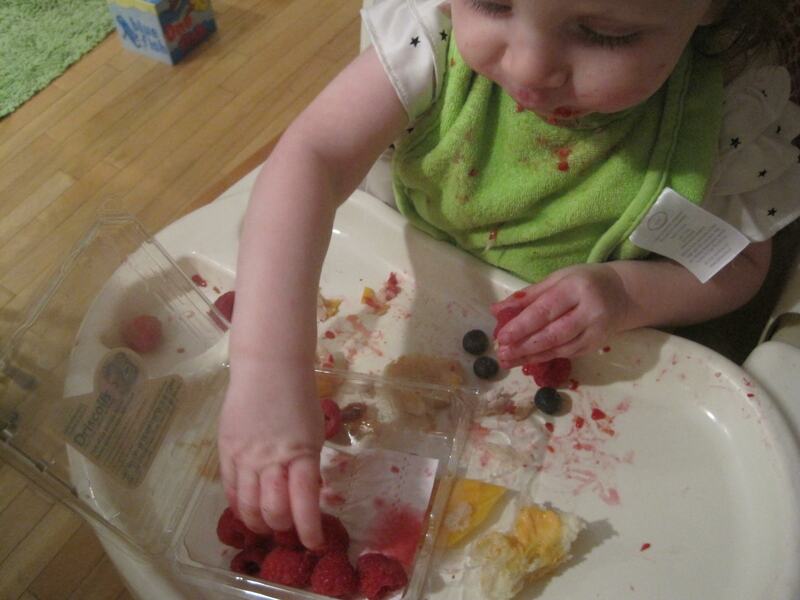 Though Baby gurgles and chatters and exclaims all day, accept for pointing, her language is mostly indecipherable. But we didn’t need a translator to tell us what the long hour of crying, little shouts and sobs meant. Her message was clear, “Where the hell are my parents? I’ve put up with you pathetic stand-ins long enough.” Grandpa couldn’t console her, a favourite uncle felt he’d lost his place of esteem, and I finally resorted to pulling a big quilt over the two of us and letting the sweet (noisy) pet sob it out. I’ve got to do better, I told myself. Think. Think hard. I brought out her buggy to attempt to stroll her to sleep. Just then a heavy rain poured down outside. But forlorn Baby had climbed into the buggy on her own. I fell into Plan B, circling the stroller through the kitchen, dining and living room, shush, shush, shushing her and, voila – she was fast asleep and dreaming. And on that night there were no tears at bed time either. It was the motion theory at work. 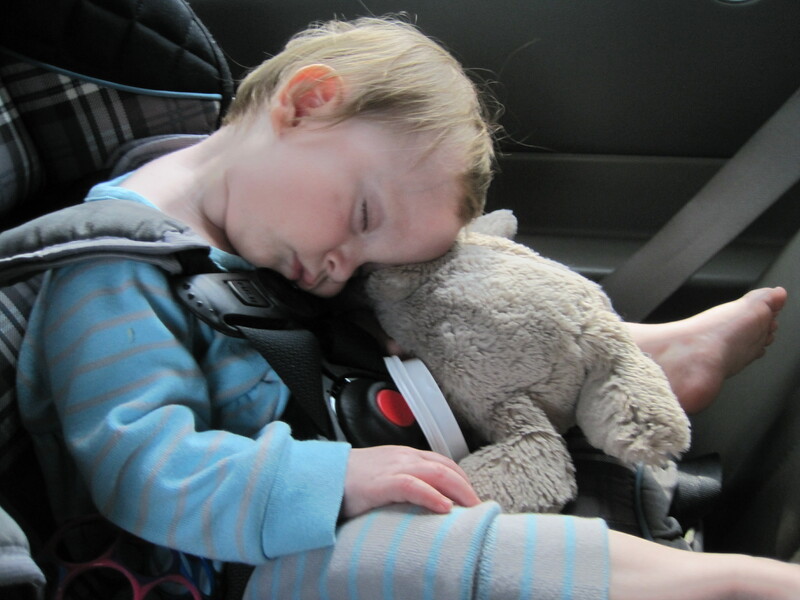 We dropped in on great-grandparents again, who can never get enough of Baby, and cleverly (finally) left at a time that my tucking Baby into the car seat with her bunny was the last image she had that night, staying soundly asleep until Day Four. Now I’ve never spilled the beans to my daughter about how sad her daughter was those first few nights. I don’t want to lose any opportunity for her to let me bond with Baby for a few wonderful (sometimes loud) days again. Darn it, why did it take me four days to rediscovered the benefits of the stroller and every mom (and grandma) should know that the car ride always works. 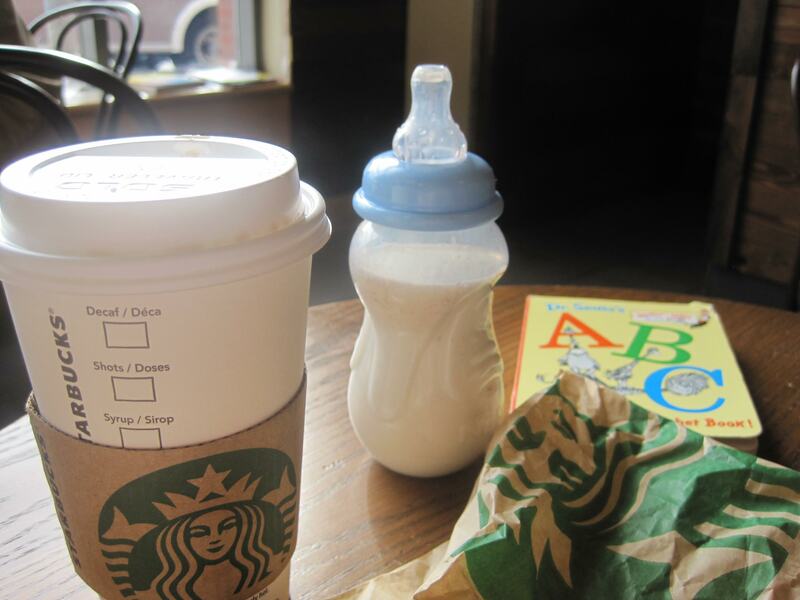 We finally had a rhythm going for Day Four and Day Five – with trips to Starbucks before nap time – Grandma needed a caffeine boost early in the day, and it was a little slice of heaven showing off my beloved granddaughter in my favourite coffee shop. And after we planned for an after dinner stroll or car ride (duh) and I whispered to smart Baby that she’d get her people back the next day, the last bedtime was calmer, too. So please let me do it again, good daughter of mine. I’ve got the hang of it again, I swear. Hey Candace, this is a lovely tribute to a loving family. I’m still trying to get used to hearing you call yourself a grandma. Wouldn’t I love to have a baby in my arms again! Thanks for your nice comments. It is lovely being a grandma. Seems different to me to say it sometimes still – but that’s okay. I love this. I think there is an underground network of grandparents who share with each other the TRUTH about caring for grandchildren. I’ve written several posts about this (http://lifeintheboomerlane.wordpress.com/2011/07/21/word-to-your-mother/.) But, really, our kids were doing all kinds of sneaky things behind our backs when they were growing up. So it’s payback time.